From concentrations in accounting and financial management to marketing and public relations, the Outer Banks Community Foundation’s Milton A. Jewell Internship Program is both a prestigious and serious affair. This year, the Community Foundation has announced José Valle, First Flight High School 2014 graduate, as its summer intern. Lorelei Costa, Executive Director of the Community Foundation, says he was chosen for his journalistic dedication. The award was established by bequest by the late Ruth Medgyes of Southern Shores and the application is open to the Community Foundation’s previous scholarship recipients. Last year, Aaron Zeigler, a First Flight High School 2013 graduate, was selected as the intern and focused on financial management and accounting. During First Flight High School’s 2014 scholarship night, José was awarded four scholarships from the Community Foundation. With some help from the Community Foundation, he graduated from Durham Technical Community College in mid-May with a 3.944 GPA and will continue his pursuit of a Journalism degree as a junior at UNC Chapel Hill in the fall. There, he will serve as The Daily Tar Heel’s Visual Managing Editor. 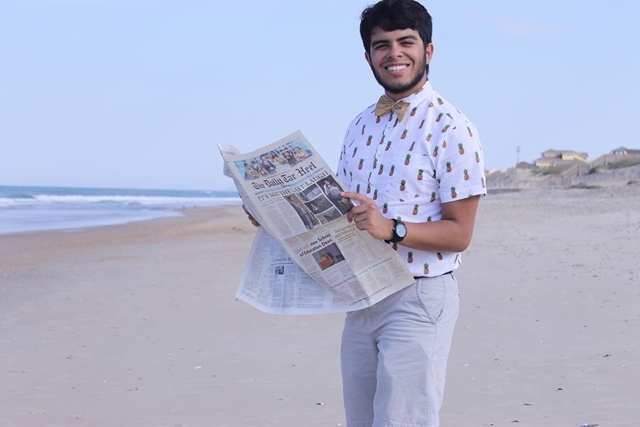 The Daily Tar Heel is UNC Chapel Hill’s award-winning student newspaper, where José has worked for the past two years, serving as 2015-2016’s Design & Graphics Editor. “I have been lucky enough to learn from some really great journalists in the past few years and I can’t wait to put these skills to use to give back to an organization that has given so much to me and many others already,” José said. He will be working closely with Lorelei for 12 weeks, managing the Community Foundation’s public relations and marketing.